Today the Rule of Law is no longer applied equally to all citizens and non-citizens. During the last decade of the 20th century and into the 21st century, it has become more apparent that laws in the United States of America are not being administered and enforced equally to all citizens and non-citizens for political purposes. Moreover, federal and state legislators have foistered on the citizens many programs and regulations which have little or no basis for standing based upon the Constitution and/or the Bill of Rights. The U.S. courts have interpreted the constitution in some very interesting ways. For instance, determining that a mandate was a tax provided the basis to implement Obamacare. The obvious divide between the application of laws among different classes of citizens was one of the major factors causing the rise of the "tea party movement" and the disenfranchisement of many of the "deplorables" voting for the Democratic nominee. Donald J. Trump was able to motivate both groups which helped turn the election in his favor. The political elite and their staffers were not included in the Obamacare legislation when President Obama issued an Executive Order ruling which exempted them. If Pres. Trump were to rescind Obama's executive order exempting members of Congress and their staffers from Obamacare, the health-care bill would probably be immediately repealed. In fact, the exemption of Congress and their staffers from the Obamacare mess just one example that proves that the rule of law is not applied equally to all citizens. A second example is the concept of a sanctuary city and/or state which effectively seeks to diminish federal immigration law. A federal judge in Arizona just ruled that Sheriff Joseph Arpaio was guilty of contempt of court for attempting to apply the rule law against possible "illegal aliens." This ruling may very well be overturned by a higher court. Failure to cooperate with federal authorities in executing federal laws is an offense. If elected officials at either the city county or state level were arrested and charged with being accessories to a crime committed by illegal aliens and prosecuted, the sanctuary city would quickly disappear. The appointment of a special counsel to investigate anything is simply an admittance that the legal system is incompetent and/or corrupt. Almost in every case, the appointment of a special counsel is seen as a political witch-hunt. Remember the Plame affair which became a criminal investigation where Scooter Libby was convicted of lying to investigators who were trying to determine who had unmasked Ms. Plame as a covert C.I.A. officer in 2003. The special counsel Fitzgerald had determined who the actual leaker was within two weeks but dragged the investigation on for four years costing $2.8 million. The CIA leak grand jury investigation did not result in the indictment or conviction of anyone for any crime in connection with the leak itself. However, Libby was indicted on one count of obstruction of justice, one count of perjury, and three counts making false statements to the grand jury and federal investigators on October 28, 2005. After several months of investigation by various agencies including the FBI without a finding of collusion of President Trump or members of his campaign, Robert Mueller was appointed as a special counsel to investigate the supposed Russian interference allegations. For years, the CIA and other agencies of the federal government have tried to influence foreign elections. Apparently, what's good for the goose is not good for the gander. Currently, we are seeing Venezuela on the verge of a civil war. The current President Maduro held last weekend a vote to change the Constitution and in effect, make himself a dictator. More than a dozen high-ranking Cuban officers are said to be in Venezuela, along with thousands of Cuban intelligence agents. Their job is to keep Venezuelan army officers under constant surveillance to prevent the feared military uprising to restore democracy. Shades of Mussolini ... and it is no wonder that the Venezuelan economy is headed to disaster. Despite wide-spread riots and starvation, the citizens of Venezuela have been unable to overthrow the current regime as their access to weapons is severely restricted. In the U.S., the deplorables are getting restless! With the main pieces of President Trump's election promises being delayed, and/or not-implemented by a Republican Congress that appears unwilling to move the agenda forward and helped by a obstructionist Democratic minority determined to throw-up roadblocks and delay the legislative process at every opportunity, the deplorables are getting restless. Most of the U.S. outside of the progressive citadels have little or no interest in the current Russia, Russia, Russia news cycle. To many of them, the main-stream media (MSM) is irrelevant. The fact that the advertising revenue and readership of the MSM is shrinking confirms the fact that most of the MSM has lost touch with much of its readership. President Trump in removing Press Secretary Spicer and Chief-of-staff Preibus removed two of the Republican old guard. Trump understands that the Swamp contains members of both parties who do not want to drain the swamp. Outside of the progressive citadels of the Eastern Seaboard from Boston to Washington, DC, Chicago, and the West Coast, the failure of the Republicans to deliver on their campaign promises is beginning to generate enthusiasm for a movement to remove many of the current Republican members of the House of Representatives and Senate during the next election cycle. The delay in the passing of healthcare reform, immigration reform and taxation policy is also serving as a focal point for a growing call for a "Convention of States". One of the main items to be considered by the proponents calling for a convention is to institute term limits for the House of Representatives and the Senate. Another of the items is to require all members of the judiciary to retire at 70 years of age. Outside of Maxine Watters, members of the House of Representatives calling for impeachment are basically seeking "air-time." However, the MSM continues to broadcast each announcement as it continues its offensive against President Trump. A recent study by Harvard University's Kennedy School's Shorenstein Center on Media, Politics and Public Policy, the overwhelming majority of press coverage in the opening months of Trump's presidency has been negative. The study found that in the first 100 days of Trump's presidency, 80% of news coverage from the leading news sources was negative, while only 20% was positive. Any real attempt at impeachment of President Trump will likely be met by a march on Washington that will dwarf all previous marches and could begin the next shooting civil war. With the House of Representatives and the Senate supposedly in control of the Republican party, any real attempt at impeachment would need bipartisan support. The members of the House of Representatives and the Senate might want to consider that outside of the blue states, citizens own and/or possess 80% of all the weapons in private hands within the U.S. The blue states all have rigorous gun laws and also high crime rates. 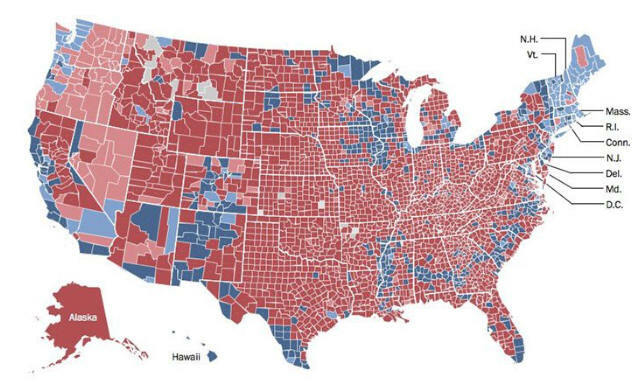 In fact, when you take it down to the county level as shown below from the 2016 election, the difference is even more apparent. Members of the MSM and Congress should understand that they have lost touch with a significant portion of the population and the divide is growing. While we can hope that the deplorables don't decide to revolt, the temperature of the rhetoric needs to be cooled down. As we have differences, it is a fact that we all bleed "red." The easiest way to begin solving the problem is apply the rule of law equally to every citizen and non-citizen in the United States of America. If some high-level Republicans and Democrats go to prison, so be it!